You know, Heck gets a lot of guff from people for not really selling the superhero action stuff, but all the real looking people are Beautiful! Truly incredible work of a perhaps mismanaged talent. your b/w is amazing. you really know how and where to use the ink. respect for your art. for real. He looks . . . invincible! That's a talented inker Don Heck could've used from Marvel back in the day! You know Heck, who had a great reputation, was drawing greeting cards before this, right? You have time to read!? This blog just gets cooler and cooler - Heck is a genius. They should do a book on him (if they haven't already). Not really sure what the feedback (if any) has been about your approach at making superheroes less muscular than what the norm is in current comics. 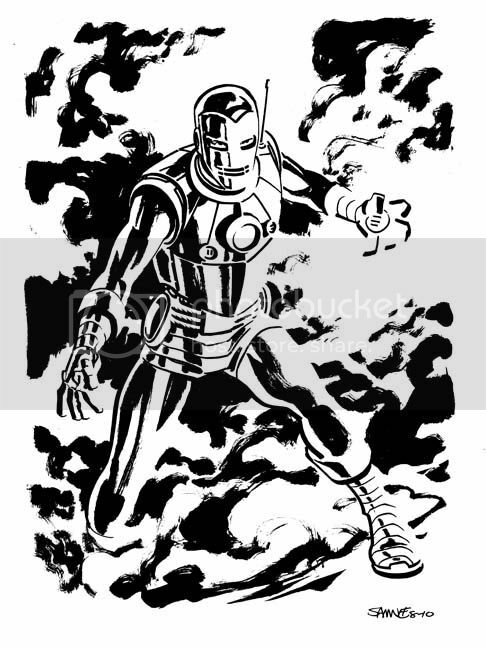 I for one really dig it and think this style is an Iron Man comic I'd love to read.